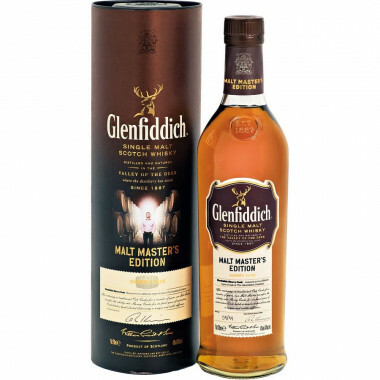 After a few years spent in Bourbon barrels, this version of Glenfiddich extended its maturation in Sherry casks. After 6 to 8 years spent in American oak Bourbon barrels, this version of Glenfiddich, crafted by Master Distiller/Blender Brian Kinsman, continued its ageing in Sherry casks for another 4 to 6 years. This results in floral, fruity, woody and spicy flavours. This first batch introduces a series of eleven versions to come, all crafted by Brian Kinsman, Glenfiddich Master Blender. Colour: topaz, reflects and light amber glow. Nose: sunny and warm. Dark chocolate, vanilla and dried fruits (nuts, almonds), over a spice mix of curcuma and ginger, aromatic herbs and heady flowers (honeysuckle and gardenia). Appealing with its fruit compote, but also quite mineral (slate, emeri cloth). Palate: firstly firm and nervous, quickly gaining more appeal and mellowness (mirabelle and greengage plum). Hold together by a refreshing tangyness, with Sherry underlined by toffee, a hint of salt, blond tobacco and citrus fruits (tangerines, bitter oranges). Finish: liquorice and tannins envelop the palate. Lovely herbal notes (ivy, meadow mushroom) develop alongside mild spices (cinnamon and nutmeg). Very pleasant mentholated freshness. Evokes a basket of freshly picked garden vegetables. Will be greatly appreciated by purists.